I’ve made this recipe so many times, I’ve lost count. I’ve always been a big fan of plain ole hummus but it’s hard to go back to the supermarket variety after you’ve eaten this version. Sure – you can purchase flavored hummus but it’s never quite as flavorful, and this is a combination that I’ve never seen sold at the market. 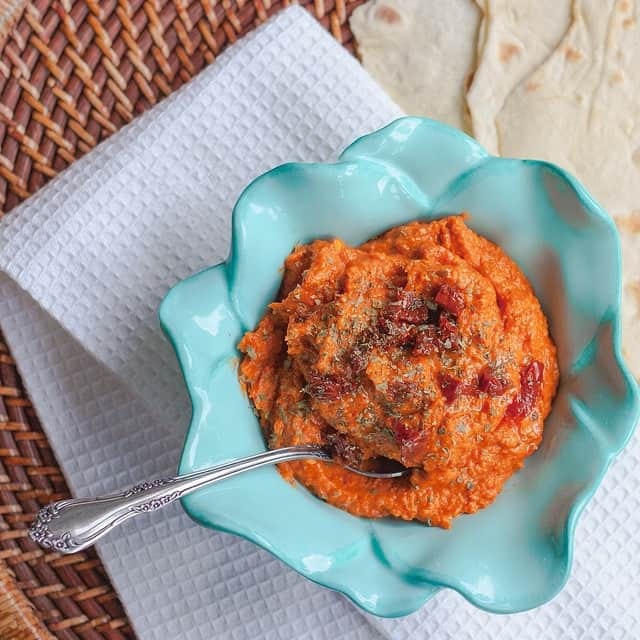 Even so, I never realized the impact that preservatives and other additives had on the flavor of our foods until I began making dips like this. Now, I’ll admit that I’m a bit spoiled because my mother roasts and freezes her own red peppers every year, a few times throughout and she shares (they are incredibly delicious and taste SO much better than store bought – no surprise, I guess). In this recipe, using homemade roasted peppers will lend a smoky flavor that adds a subtle note to the smokiness from the chipolte seasoning. Of course, this is not required, and so using the jarred version is fine. This is where I cheat: the original recipe called for the addition of one chipolte pepper in adobe sauce (canned), and I tend not to keep those on hand, although I do stock most of the other ingredients. As a result, over time, I’ve adapted the recipe include chipolte chili powder. I also don’t stock tahini, and quite frankly, I can’t tell the difference when the dip is made with or without it, but maybe it’s just me? The reason I don’t miss the tahini may also be attributed to the very bold flavor of this hummus, wherein the subtle flavor of tahini may be lost…I’m not sure. Either way, I realize that it is a required ingredient in most hummus recipes, and so I’ve included it in the recipe below and will leave it up to you to decide on whether or not to include it. 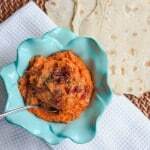 This hummus can be served as a dip or wrapped up in a pocketless pita. I plan to add a recipe for my favorite pocketless pitas sometime soon. Once you try the homemade pitas, you will never go back to the store bought ones, I promise. They are that good. And so is this hummus. Combine the first 8 ingredients in a food processor and mix until smooth. Season with the last 5 ingredients as noted in recipe or to taste.